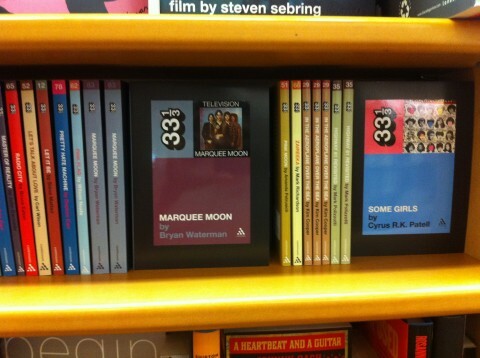 Over the next week or so Cyrus and I are officially launching our 33 1/3 volumes on the Rolling Stones’ Some Girls and Television’s Marquee Moon with a series of readings, a radio appearance, and a big bash with live music (the details of the last have yet to be ironed out). Monday 6/20 we’re reading at McNally Jackson, on Prince Street in Nolita, at 7pm. Tuesday 6/28 we’re reading at Word in Greenpoint, BK, also at 7pm. We are also planning a more festive launch party with live music from the current BK scene in Williamsburg on 6/26. We’re still working out details on that event and will post updates as soon as we have things finalized. You can also tune in to hear us on WFMU the morning of Tuesday the 28th, where we’ll be talking with DJ Trouble about the NY scene in the 70s and perhaps even spinning some tunes related to our books. Find that at 91.1 FM or at wfmu.org around 10:30 that morning. Comment or post questions live as we go and we’ll do our best to respond. We hope to see and/or meet many of you at one, two, or three of the above. Catch you on the airwaves/Internet for the fourth. Our Friday afternoon playlist comes from Jenn Pelly, a Brooklyn-based music writer and recent NYU grad in English and journalism. Her music writing, often about the current BK DIY scene, has appeared on Altered Zones, Thought Catalog, and elsewhere and she maintains the weblog Pelly Twins with her sister Liz, who writes about music for the Boston Phoenix. Jenn is a WNYU alum (though she’ll host the New Afternoon Show through this summer) and is also a veteran of #wny11 and the first run of my Downtown Scenes course last summer. Follow her on Twitter @jennpelly. This mixtape is half all-time favorites and half contemporary locals, which to me totally exude “New York.” I left off many of my actual favorites for the sake of avoiding the obvious and out-of-place, but these songs are all steeped in my memories of bumming around the East Village in high school and floating around today’s Brooklyn DIY scene. Download the entire thing right here, or stream Side B below. I tried to avoid the obvious, but I couldn’t help including a few. Blondie, Richard Hell, and especially Jeff Buckley are, for me, the musical equivalent of that part of Joan Didion’s essay “Goodbye to All That” where she talks about what New York was like for her “before she knew the names of all the bridges,” when everything was still exotic and unfamiliar. They remind me of my romanticized 15-year-old notions of the city. What I love most about this playlist is how traces of Side A can be found all over Side B; when I took Bryan’s “Downtown Scenes” class last summer, I couldn’t help consistently drawing parallels to New York’s underground music culture today. If you’re into music, nothing’s more enthralling than your own times. At least when you’re 21 in a place like New York. Starting up Side B is “FAO” from retrofuturistic Brooklyn band LA BIG VIC, which includes New York native Emilie Friedlander on vox/violin, guitarist Toshio Masuda of Osaka, and synthesist Peter Pearson. Emilie is editor of two music websites, Altered Zones and Visitation Rites; Toshio previously performed in a major label J-Pop boy band; and Peter is an apprentice to Pink Floyd’s former live sound producer, Jeff Blenkinsopp. They’re the type of band that could have only formed in New York. Also of note here is “September with Pete” from Woods, whose place at the center of the Woodsist label makes them poster-children for my generation’s NY music culture. (Not to mention that, at the drummer’s recording studio, Rear House, sessions “usually start with a conversation about the first Ramones record.”) I love the sense of community that seems to circle Woodsist, the cultural importance of which I first felt in ’09 at the inaugural Woodsist/Captured Tracks festival. “September with Pete” also features Pete Nolan of Woodsist band Spectre Folk. Repping the Captured Tracks camp here is the young band Widowspeak, whose debut “Harsh Realm” 7” is like a more magnetic Mazzy Star. Where indie rock and pop is concerned, Side B has also got The Babies, Vivian Girls, and Coasting. Coasting is Madison Farmer (of Dream Diary) and New Zealand-transplant Fiona Campbell (drummer for Vivian Girls), who met while working at DIY shows in Brooklyn. On the slicker side of the spectrum is Holy Ghost!, a disco-inspired duo of Manhattan natives who take more than a few cues from New York scenes of the 70s and early 80s. Their debut LP was released this year on James Murphy’s label, DFA — who also released early LPs from the experimental electronic group Black Dice. I like to think of my life’s milestones in terms of live music events, and seeing Black Dice (who grace Side B with 2009’s “Glazin”) at Bushwick venue Market Hotel in 2008 certainly makes the cut. I was 18 and living on the Upper West Side, and it was my first time at Market Hotel; I had no idea where I was, and the kids at the shows were all so hip, they looked like aliens to me. This week, to mark the release of our volumes in Continuum’s 33 1/3 series, we continue our series of guest playlists from friends, critics, and fellow music lovers. (Check back late afternoons: we’ll probably be posting two a day.) Given that both our books focus on New York in the 70s, we’ve asked contributors to curate lists along the lines of a loose theme: “favorite NYC records.” What constitutes a “NYC record” is left to their discretion. This morning’s list comes from Bart Plantenga, host of the Amsterdam-based radio show Wreck This Mess (formerly on WFMU). He’s also author of the (NYC set) novel Spermatogonia: The Isle of Man and another novel, Beer Mystic, which he describes as being “about beer and mysticism in NYC c. 1987 and is currently going around the world excerpt by excerpt via the world’s longest pub crawl.” Follow him on Twitter @bartplantenga. The thing was, we could’ve spent hours “in” Paris and NY. There are probably many reasons why there are so many songs about NYC and Paris — some of which are honorable, enthusiastic, and laudatory, while others may be more sycophantic or opportunistic such as built-in airplay or esteem by association. Some may be hyperbolically respectful, oozing civic pride or nationalism even. So more often “New York, New York” than, say, Gil Scott-Heron’s “New York is Killing Me” or middle period Lou Reed, when he was just getting crusty enough to be indignantly grumpy on songs like “Dirty Boulevard,” where he takes on the betrayal of promise head on. In any case, city songs require a few designated landmarks that anchor them to a particular place. A street, club, or building name may instantly evoke a thousand memories, a confluence of mind’s eye film footage flooding past… And what about wordless songs that evoke the ambiance of the city? Strangely enough for you, not me, my favorite NY song is by Frenchman Serge Gainsbourg [Tim B. already beat me to it!] A perfect song, jungly rhythms of a cosmopolitan/Parisian version of an Olatunji song and great lyrics (“I’ve seen NY / Never seen anything like it / I’ve never seen anything so high / it’s all high in NY”) and then listing the names of some skyscrapers: “Empire State Building, oh, it’s so high” Rockefeller Center, International Building, Waldorf Astoria, Pan-American Building, Bank of Manhattan, Time and Life Building, American Hotel, C.B.S. Building, R.C.A. Building like a concrete mantra … Serge is a unique French performer who did it all; there is no one like him in Anglo culture: part Leonard Cohen, Dylan, Dean Martin, Kerouac, Oscar Wilde… Excellent 1964 video [during the Scopitone heyday] with Serge hanging from a skyscraper ledge, singing. A magical remix: “New York U.S.A.” Snooze vs Serge Gainsbourg. Snooze hits it head on. Here is a live, sloppier rendition of the very pristine acr:mcr [A&M 1990] version by this great white funk band from Manchester, UK. In the same category as Liquid Liquid, Rip Rig & Panic, Pop Group, early New Order… I like lyric-less songs about NYC that evoke the sound and feel of the city [Charlie Parker et al.] Here we have serious grooves oozing ironic frivolity driving a sense ignored existential gloom. The Manchester studio version just feels like a hot day on the city streets, humane and percussive with shimmering hints of street ambience. It’s not exactly why I moved to NYC but this great declamatory clenched fist manifesto did help justify/motivate the move. “I’m gonna get out of here, I’m gonna get on that train, / I’m gonna go on that train and go to New York City / I’m gonna be somebody, I’m gonna get on that train, go to New York City, / I’m gonna be so big, I’m gonna be a big star and I will never return …” And of course she was right. This brilliant full-CD memoir by this gifted vocalist evokes vivid, visceral, highly poetic images of growing up in East New York, Brooklyn. Hirsch’s repertoire –- which includes abstract vocals, storytelling, comedy, local accents, memoir, urban history, and singing –- is perfectly equipped to handle NY’s hectic audio overload and make some [non]sense out of it. 5. “A New York Minute” by Alan Licht, A New York Minute, XI, 2003. OK, this is such a simple idea, weave together a 15-min. yarn of radio weather forecasts to create a true sonic, rapid-fire logorrheic tapestry of NY -– especially in the morning on snowy/stormy days -– and the human/NYer preoccupation with weather reports. So simple it’s genius. I once produced a similar but less-brilliant, piece “Trafficante Onosphere,” and what surprised me was how winter weather reports remixed can evoke a certain apocalyptic angst. Despite the motormouth velocity of Licht’s composition, these weather reports have a kind of meditative effect – soothing and mesmerizing. Also: Charlie Morrow, “Central Park 1850” and Central Park 2007” on Toot, XI, 2011. He also adds, by way of liner notes: “Unlike Gerry Mulligan, Pepper Adams played baritone sax like a Brooklynite and went to Knicks games. Albert Ayler: From John Coltrane’s funeral, July 21, 1967, St. Peter’s Lutheran Church. What’s on your NYC playlist? This afternoon’s installment in our guest playlist extravaganza comes from the 33 1/3 series’ mastermind, David Barker. David, a UK native with a PhD in English from Newcastle University, is U.S. Editorial Director at Continuum Books in New York. He conceived and launched the 33 1/3 series in 2003. (Here’s a 2005 interview conducted by Daphne Carr, who six years later is the author of the series volume on Nine Inch Nails.) Cyrus and I owe David a special debt for accepting our proposals and keeping our volumes on track. Thanks, too, for participating in this playlist series. I have a horrible feeling that Fannypack were/are some kind of post-ironic Park Slope hipster joke band (and I can’t be bothered to look it up, obviously). But I’ve loved this song since it came out a few years ago, and the nonsensical way that it encapsulates a certain way of being young, dumb, and carefree in NYC. My Dad was a huge Nilsson fan when I was growing up in suburban England in the 70s. This song is gorgeous, wistful, aspirational, and lovely. How does it feel to be part of a legendary NYC scene, and then basically forgotten about, 30 years later? You have to read Joe Bonomo’s fabulous book to find out, but this relatively recent song sounds like a bunch of middle-aged guys still in love with the city after all that time, and putting their peers to shame. Preposterous, really, that this song was prevented from being the UK’s Christmas Number One in 1987, by the Pets Shop Boys’ cover of “Always on My Mind.” It’s a work of singular genius, encapsulating so much of what visitors think/feel/believe about New York City, and it never fails to make me cry when they play it on every single Virgin Atlantic flight from the UK to NYC in the month of December. This morning’s playlist comes from Daphne Brooks, who teaches in Princeton’s English Department and Center for African American Studies. Her books include Bodies in Dissent: Spectacular Performances of Race and Freedom, 1850-1910 and the 33 1/3 volume on Jeff Buckley’s Grace, which she treats not only as an inroad to the East Village in the 80s and early 90s, but also as a window onto the long history of race and popular music in America. She’s also a teacher and member of the board of directors at the Willie Mae Rock Camp for Girls. This afternoon’s installment in our NYC playlist marathon comes from Eric E., aka Esquared, long-time denizen of the downtown blogosphere and virtual friend of PWHNY who describes himself as “a gentrified new yorker who’s finally appreciating the past, and slowly appreciating the present, and hopefully the future of nyc.” You can follow him on Tumblr or @cire_e on Twitter. We don’t need to educate, We only want to stay up late, Looking for these broken joints, Take in a peepshow? Laurie Anderson – O Superman from hype on Vimeo. This afternoon’s playlist comes from Amanda Petrusich, a staff writer for Pitchfork and senior contributing editor for Paste. Her books include It Still Moves: Lost Songs, Lost Highways, and the Search for the Next American Music and Pink Moon (33 1/3 series). Her work has appeared in the New York Times, Spin, the Village Voice, the Onion A.V. Club, the Oxford American, ReadyMade, eMusic.com, MSN.com, and elsewhere. She compiles the weekly pop listings for the Times. She’s currently at work on a book about record collectors, as will probably be plain by her selections below. Follow her on Twitter at @amandapetrusich.